Mr. Taylor and I went directly from the airport to Videogames Then & Now, which is this fantastic store out in Norridge. If you are ever in Chicago, do yourself a favor, rent a Zipcar, and make the drive. We ought to have recorded ourselves talking in there, because we were hilarious. As a matter of fact, the gentleman behind the counter thanked us for being such lively loiterers, and I admitted to him that ordinarily I am very in-and-out of that store, all business. This time I was excitable, even a little bit twerpy; I’ve seldom had so much fun in public. BT and I spent a long time among the stacks of NES cartridges. 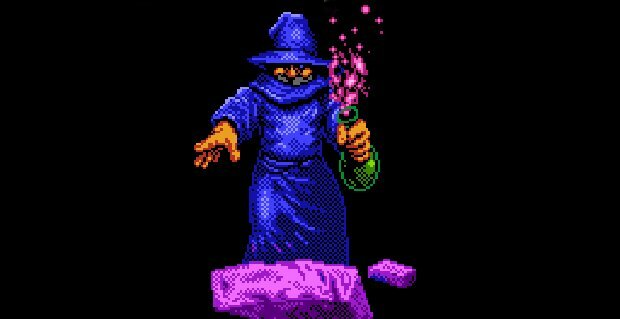 We are both great fans of the MacVenture games and their NES ports, and I found Shadowgate pretty easily. Brian wanted his own copy of Déjà Vu, and I located that pretty nimbly, too. I also snatched up the NES Gyruss—that “tube shooter” is only the greatest arcade machine ever—while Brian, who is even more into hardboiled crime fiction than I could ever aspire, picked up a bizarre little game called Nightshade. I hope he decides to write about it. We also sat down with an old issue of Nintendo Power and basically copy-edited it. We flipped through multiple “how to beat” and “cheat codes” books, too, a couple of which were authored by Jeff Rovin. “The cover of this book reminds me of—did you ever see that Unauthorized Teenage Mutant Ninja Turtles book?” I asked Brian. Now I lamented in-store that I have only one Wii light-gun game (“It’s Resident Evil: Umbrella Chronicles,” I told Brian, “and I loved co-op because it stopped Nik and me from arguing, for once”). Brian laughed, then assured me that House of the Dead: Overkill would be worth my while. Then, immediately after we left the game store—and this is the probably most ridiculous part—we popped a U’ey and drove back to a GameStop to look for Dead Space: Extraction. Back at the ranch, I demanded that BT look at some of my favorite Atari 2600 games. Most of these are really beautiful ports of fuller arcade experiences. I play videogames on an eight-year-old HD cathode television, and when it finally burns out or breaks, I will probably pay through the nose to have it repaired. This decision has something to do with my affection for light-gun games, which sometimes rely on scan lines, but it has everything else to do with the Atari 2600. Professor Ian Bogost has made much of the value of phosphorescent bleeding, and in a game like Berzerk the walls really do burn blue in the eeriest way. (Here is its original arcade incarnation; note how luminous the walls’ glow.) I explained all this to Brian because I was suddenly embarrassed about my television set. I also showed BT Solaris (“Like, the Tarkovsky film?” “NO”) and Space Shuttle, which was a gift from Kevin. BT was especially smitten with that game, because—and I did a terrible job of demonstrating this without the game’s reference sheet—the 2600’s six switches are meant to represent the shuttle’s control panel. The game itself is a meticulous procedural. In addition to the normal joystick controls, Space Shuttle uses all of the console buttons to control things like primary/secondary engines, cargo doors, and landing gear. The manual is a thick, 30-page booklet containing procedures, diagrams, and charts. A quick reference sheet is also included, and there’s even a template to place over your console switches! The screen displays the instrument panel and a view out of the windshield. BT started talking about what a novel thing it is, to have the hardware itself become such an integral part of the game experience, and I responded with some weird anecdote about a magical game I had played in childhood, but anyway I agreed with Brian. Then we talked about how emulation always fails in some way anyway, but in this case it fails spectacularly. “Yes, yes, yes,” I agreed. “And this guy is like way into lutes.” Incidentally, with thirty seconds’ research, I located this photo of Follin holding a mandolin, which I figure is close enough. I regret not knowing about this visionary sooner, as he’s already retired. But I was pleased to discover that Frank Cifaldi interviewed Follin in 2005. In the end it is probably all right that Brian and I didn’t record ourselves saying or playing anything, because it would’ve gone on for hours and hours. That Nightshade cover is a thing of beauty. It’s like someone decided to paint the Neighborhood Watch Guy ( http://www.msa2.saccounty.net/.....0Watch.JPG ), furiously shaking his fist at all of his crime being prevented, presumably by the Caped Crusader being called for in the sky, The Avenging Anubis. I want a poster to put on my ceiling, honestly. Wasn’t Nightshade the game where when you die, you had to solve a death trap to earn a continue? 1) Speaking as a fan of Studies in Crap, that was incredible. 2) You posted that on my 28th birthday! 3) I feel like maybe, probably in his ongoing quest to subvert canon, Rovin got all the Turtles’ heights wrong. Someone other than me thought Prey was fun. I AM NO LONGER ALONE. Gyruss came out on the 2600? That’s Keanu Reeves WHOA right there. I only ever played on the Atari 2600. Solaris, I loved that game (along with Neubauer’s Radar Lock) which I was exposed to when I went back and relived my 2600 childhood after I graduated. But I could never complete it. There was also a “one-way” corridor inadvertently stuck in there, once you warped through it, you couldn’t get out. Game over. This kind of shopping no longer happens for me. The touch and feel of box and CD… these days are now sadly over. I have surrendered to our new DRM overlords it seems. Those are the points. Thanks. I prefer the 2600 Gyruss to all the other versions I’ve played of it. It’s the rare video game that accurately portrays the desolate silence of space, even if it is strictly for hardware reasons, and that version of the Toccata & Fugue song just sounds so otherworldly coming out of the 2600, very desperate. Honestly, I’d never have known it was that song if I hadn’t looked it up, but it fits very well. You ever try Berzerk with Evil Otto in play? I do love making the intentionally stupid AI wander into walls, but I also enjoy the sheer terror of being mercilessly hunted by a big smiling face. Suddenly you are racing through the levels, trying to blow up as many robots as you can before Otto arrives and crushes you for good. Berzerk: possibly the first intentional survival horror game? I really need to get out to Chicago again sometime soon. That store is fantastic. Yeah the Picture of Follin with the Mandolin blew me away when I found it as well. Thanks for the link back 🙂 . Awesome blog ! Videogames in Norridge is actually not the best game shop in the Chicago area!! You should have checked out People Play Games on Clark in the city, about 3 blocks from Wrigley Field. Much better selection and prices on retro games, also everything that comes into the shop is cleaned up and refurbished before being sold.